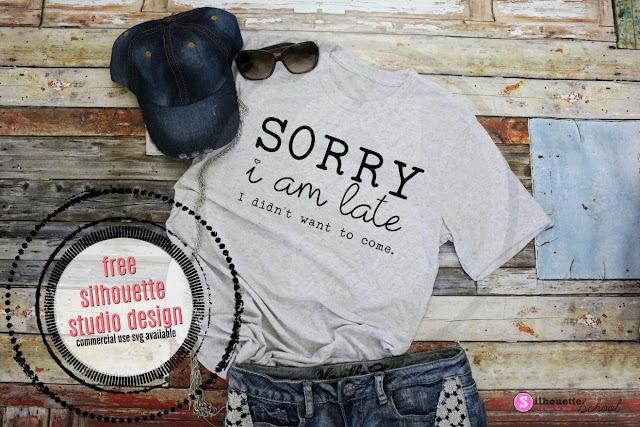 Just like we do every Friday here on Silhouette School - it's Freebie Friday!! 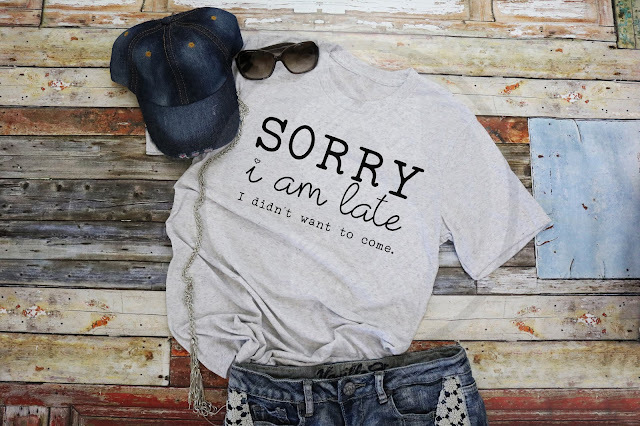 This week I'm sharing a design that makes me giggle...a lot. The Sorry I'm Late free Silhouette Studio design file cute on a shirt, but of course you could also put pretty much anywhere! If you think it's as funny as I do, then head on over and download the design for free! Please keep in mind it's a free for personal use. And if you want to share - we'd love that. We just ask that you please share a link to this blog post and not the link to the Dropbox or the file itself. Looking for a commercial use SVG version of this design? You got it! The Sorry I'm Late design (and the mock up photo) is also available as a personal and commercial use SVG from our sister site So Fontsy both as an individual design or as part of the Mommin' Aint Easy Bundle.